Steve Williams, the Telford Property Cleaner, provided an extremely competent and helpful service. He and his team did a superb job of clearing our gutters which were severely blocked. Many thanks for an excellent job at a great price! Why Do I Need My Guttering Cleaned? 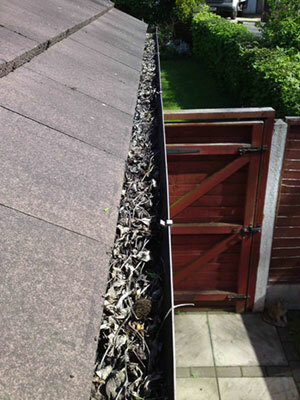 Over the course of 12 months, your gutters get filled with many types of debris. It is obvious that in autumn, our gutters fill with leaves. This can both restrict the waterflow and in many cases, completely block downpipes. If you do not clean out your gutters after the fall but before winter, you can have serious damp problems. November is the ideal time. If leaves have blocked your downpipe, the water will sit in the guttering. Water is heavy and guttering is not designed to hold that weight. It is built for flowing water, not standing water. When the standing water freezes in winter, it expands. 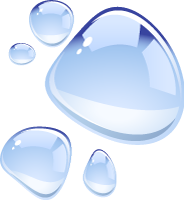 When the water expands, it breaks the joints of the guttering, creating a leak. In spring, many trees shed seeds and dead twigs. Again, if left, these can easily cause blockages. By having your gutters cleaned, you can avoid a lot of problems. What Problems Does Blocked Guttering Cause? The weight in blocked guttering can cause the gutters to come away from the fascia board. In some cases, the guttering may fall off the fascia completely. More damaging than this can be the overflow of water into your property. This can lead to damp problems in your walls or foundation. The problems that blocked guttering can bring are often underestimated. How Often Should I Have My Guttering Cleaned? We recommend gutter cleaning twice a year for the reasons mentioned above. It is a preventative maintenance for your property, just like getting the oil changed on your car. Many people view their gutter cleaning as an annual job. If you only have the option of having your gutters cleaned annually, the ideal time is in November after the leaves have come off the surrounding trees but before the bad frosts start. Can You Clean Guttering Above A Conservatory? Yes. We have all of the access equipment necessary to carry out gutter cleaning above conservatories safely. What Height Can You Go Up To In Order To Clean My Gutters? Because we have an IPAF cherrypicker license, we are able to clean guttering at heights of up to 110ft and reach areas that are difficult to reach from ladders. This service is used on commercial buildings only. We remove leaves and debris from gutters at heights of up to 110ft. We have over 17 years experience of gutter cleaning. We offer our services to commercial and residential customers as well as to businesses. We specialise in high-level gutter cleaning by using cherry pickers. We have an IPAF licence which means we are trained to use cherry pickers and scissorlifts. So if you are a maintenance manager of a company, please contact us and we can provide you with a site survey and quote. If you are a residential customer with a conservatory, fear not. We have all of the equipment and know-how necessary to clean guttering above conservatories safely. We offer a comprehensive gutter cleaning service that will unblock all gutters, downpipes leaving them free from silt, leaves, moss and other debris. We carry out minor repairs and advise you regarding any further repairs which may need to be carried out. Upon request, we can source and fit various types of gutter guards to slow down further blockages. 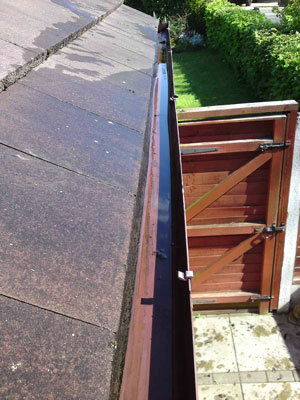 If requested, we are able to provide you with photographs of before and after the gutter cleaning. These can be arranged to view on the day, free of charge. Other cleaning services we provide include window cleaning, solar panel cleaning, driveway & patio cleaning, driveway restoration, block paving sealing, imprinted concrete tinting and sealing and tarmac restoration.